IntelliDrug is an IST Program project to develop a device for controlled drug delivery that is the size of a tooth (it may be as large as several molars). The IntelliDrug device would be implanted in the mouth of a patient, where it could provide regular, measured doses of medication. micro-sensors capable of determining concentration of selected medications in the blood stream. The IntelliDrug device will work with a remote control to inform the patient and physician if the drug container needs to be refilled. 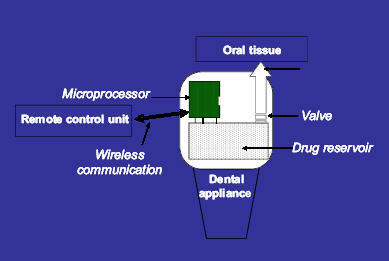 The IntelliDrug system reminds me of the gas-dispensing tooth from Frank Herbert's 1965 novel Dune. The situation in the novel is complicated; suffice it to say that Dr. Yueh has prepared a means of dispensing a poison gas from an exact duplicate of a tooth. That peg tooth I put in your mouth after the tumble at Narcal--that tooth must be replaced, in a moment, I'll render you unconscious and replace that tooth." He opened his hand, stared at something in it. "An exact duplicate, its core shaped most exquisitely like a nerve. It'll escape the usual detectors, even a fast scanning. But if you bite down hard on it, the cover crushes. Not quite the same, since Herbert's idea is obviously for a single-use sytem. But it's still a drug-dispensing tooth. The snakelike robots are highly maneuverable - they can form tight S-curves and have six degrees of freedom. Unlike other efforts to grow liver cells, this new technique allows researchers to actually duplicate the structure of the organ. PixelOptics believes that their SuperVision system can improve anyone's sight to better than 20/20 vision. Read more about the Tooth implant 'to release drugs'; see also the IntelliDrug website. Thanks to Zac Hunter and Ja Thavia for suggesting this story.